To promote regional working landscapes that support a sustainable foodshed, nine partners launch Catskills FarmLink, an online resource that connects farmers and landowners throughout the New York City Watershed. The site promotes the Catskills as a great place to operate a small, diversified farm and seeks to maintain the region’s working landscape by connecting farmers with underutilized agricultural land. With growing season only weeks away, putting farmers on the land just got easier with Catskills FarmLink. The online resource serves as a matchmaking service, connecting farmers looking for land with property owners looking to keep their property within a working landscape. Launched in October 2011, Catskills FarmLink is now hitting its stride, with over 20 properties ready for early Spring tilling. Catskills FarmLink provides the mechanism for connecting underutilized land with those interested in farming it. The initiative was a collaborative effort of the Watershed Agricultural Council and eight partners involved with regional agriculture and food networks. New York State has an estimated 2-3 million acres of underutilized farmland. “The land of New York State’s Catskills Region offers enormous agricultural opportunity and is well-positioned for supplying metropolitan areas with fresh produce and meats,” adds Janiszewski. “Catskills farmland is ideally suited to grow and raise food. These foods contribute to the economic viability of our small communities. And in turn, farming maintains the mountains’ rural esthetic and farming way of life. The Catskills are a prime location to farm for profitability because of its proximity to the New York City metropolitan market. Many local farmers start small and incorporate livestock, vegetables and high tunnels to maximize their profits. We hope the website makes it easier for those eager to work land to find Catskills partners willing to share the soils beneath their feet.” Known originally for its dairy products and now for its proficiency in growing grass, the Catskills region plays a prominent role in grazing livestock such as beef cattle, sheep and goats. 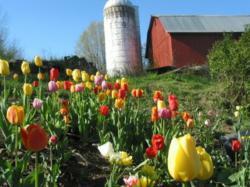 Just behind tourism, agriculture is a primary economic driver in New York State. Catskills FarmLink website compiles user-submitted properties and offers a range of resources related to land access. “The site serves beginning farmers looking to transition to independent farm management, existing farmers looking to acquire or access more land, and landowners interested in making property available for agricultural use,” adds Janiszewski. “What makes Catskills FarmLink properties special is the number of lands available for lease that are owned by the City of New York. These lands are part of a larger watershed management scheme, where working landscapes are part of the clean drinking water equation. The New York City Watershed provides over 1-billion gallons of water each day to over nine million New Yorkers. Farming on these lands comes with an added stewardship ethic, farming on two levels that address the public good.” Catskills FarmLink currently has 22 property listings, eight are owned by the City’s Department of Environmental Protection. compile opportunities like educational workshops, networking events, classifieds, internships, job offerings, equipment and livestock sales, and distribution partnerships. Catskills FarmLink is a collaborative effort of regional organizations committed to the future of agriculture in the region. These organizations include Catskill Mountainkeeper, Cornell Cooperative Extension (Delaware, Schoharie and Sullivan Counties), Delaware Highlands Conservancy, Farm Catskills, Farmhearts, NYC Department of Environmental Protection, and the Watershed Agricultural Council. Visit http://www.catskillsfarmlink.org to explore land listings, learn more about farming and land access in the region, or sign up for the monthly e-newsletter.